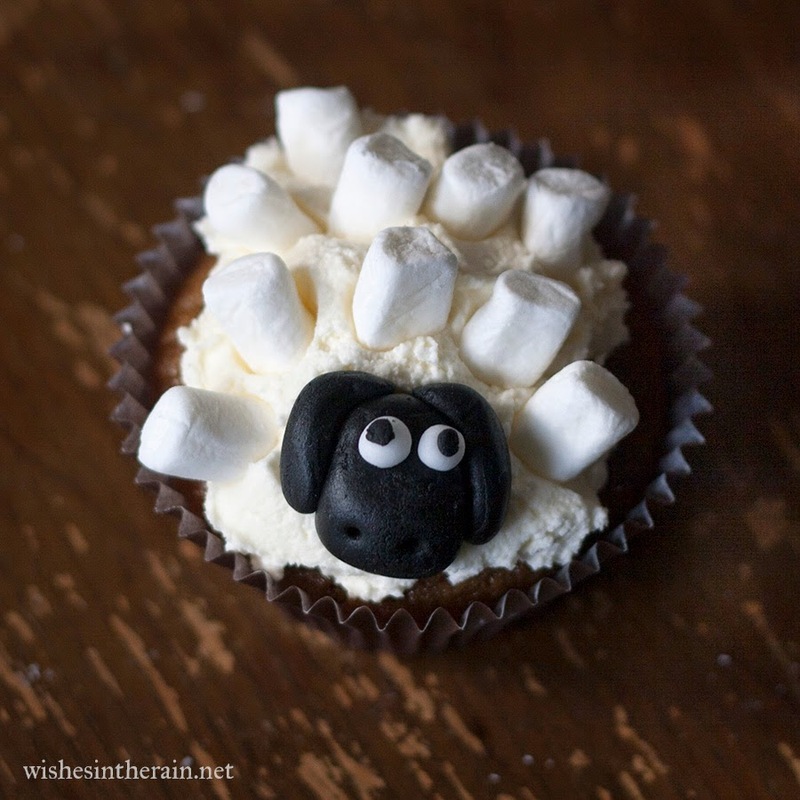 Two weeks ago, my next door neighbour asked me if I could make sheep cupcakes for their church. 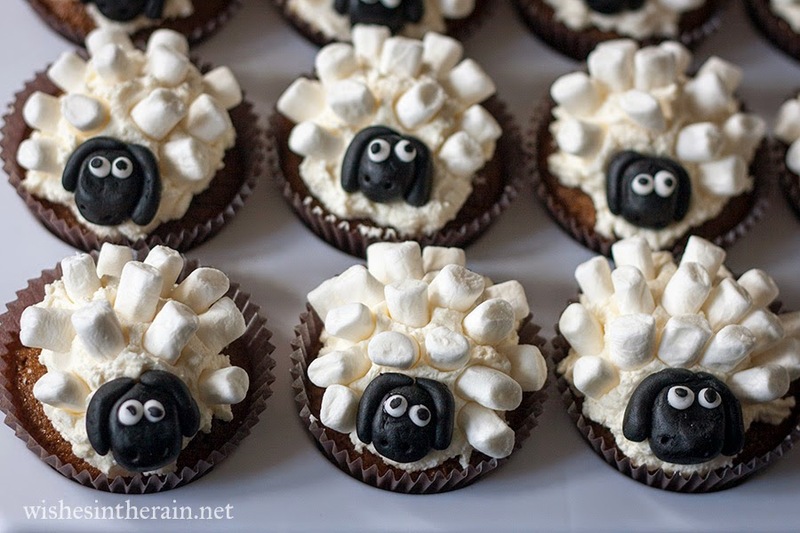 I had never thought about sheep as a thing you could have in cupcake form before, but why not? I find it hard to resist a challenge! Of course my first port of call for something like this is Pinterest. 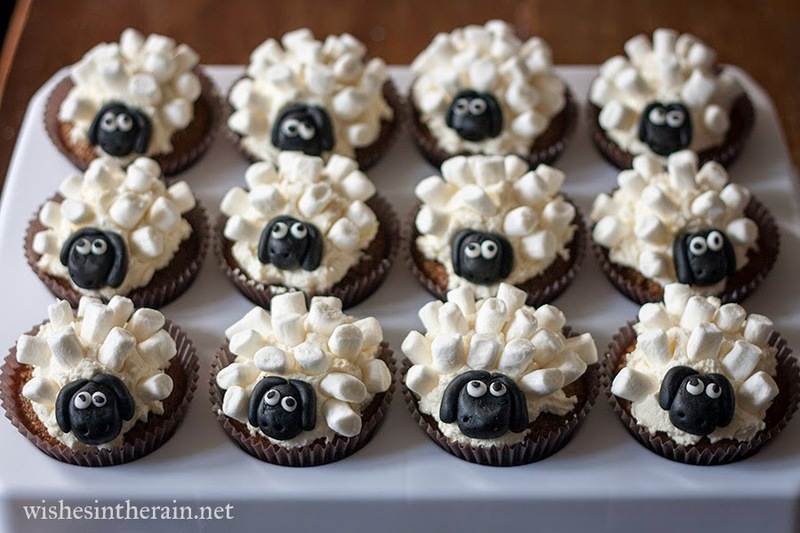 I really had no idea what a sheep cupcake could possibly look like, but looking at the pictures, I was happy to see that there were a lot of options that looked do-able. I enjoy piping buttercream, but I know I wouldn't be able to do it in a wool-like manner, so mini-marshmallows seemed to be the better option. I didn't take any photographs while I made these so it isn't going to be a tutorial, but I made the eyes first, by making small balls of white fondant icing and even smaller balls of black and sticking them together with a little water. Then I made blobs for black fondant for the sheep faces, squeezing one side a little flatter and then sticking the eyes in, sticking with water again. I made the ears by rolling out a sausage of black fondant icing. The cupcakes are coffee flavour (following the linked recipe but without the espresso syrup), with white chocolate buttercream, as requested by my neighbour. I spooned the buttercream on to the cake, pressed in a sheep face, then stuck in mini marshmallows in the rest of the buttercream. I'm so pleased about how they came out because I'm really not good at making things like this with my fingers - fimo clay is largely wasted on me. But although they look a bit crazy and did take me a long time to do (the sheep faces took about three hours but I was watching Supernatural on TV at the same time! ), they were well worth it. Should I make some too? I'm sure like me you've seen a lot of Pinterest fails, but this definitely qualifies as a Pinterest win. These would be great for a farm theme party or for an Easter or spring lamb theme. Also they tasted pretty good, even if I do say so myself!